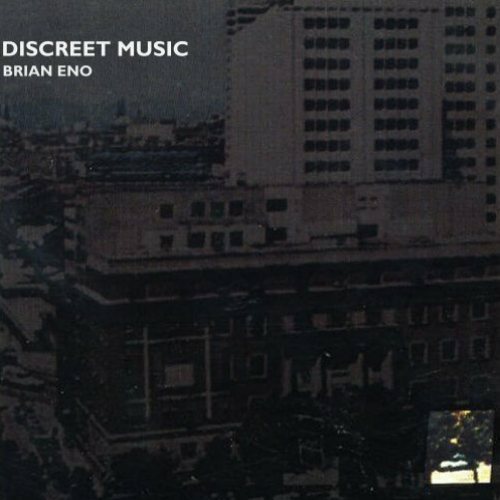 Discreet Music (1975) is an album [liner notes here] by the British ambient musician Brian Eno. While No Pussyfooting may be his first ambient album and Another Green World features many ambient pieces, this is Brian Eno’s first purely ambient solo album. It is also Eno’s first album to be released under his full name “Brian Eno”, as opposed to his previous rock albums released simply under the name “Eno”. Brian Eno’s concept of ambient music builds upon a concept composer Erik Satie called “furniture music”. This means music that is intended to blend into the ambient atmosphere of the room rather than be directly focused upon. The inspiration for this album began when Eno was left bed-ridden by an accident and was given an album of eighteenth century harp music. After struggling to put the record on the turntable and returning to bed, he realized that it was turned down toward the threshold of inaudibility and he lacked the strength to get up from the bed again and turn it up. Eno said this experience taught him a new way to perceive music. This album is also an experiment in algorithmic, generative composition. His intention was to explore multiple ways to create music with limited planning or intervention. The second half of the album is three pieces collectively titled “Three Variations on the Canon in D Major by Johann Pachelbel”. These pieces were performed by The Cockpit Ensemble, conducted and co-arranged by Gavin Bryars. The members of the ensemble were each given brief excerpts from the score, which were repeated several times, along with instructions to gradually alter the tempo and other elements of the composition. The titles of these pieces were derived from inaccurate French-to-English translations of the liner notes of a version of Pachelbel’s Canon performed by the orchestra of Jean Francois Paillard. In “Fullness of Wind” the tempo decreases relative to the pitch of the instrument. The violins have the fastest rate of decay while the basses have the slowest. This piece features effects and processing by Brian Eno. In “French Catalogues” notes and melodies of similar tempos are gathered into blocks from different parts of the score. In “Brutal Ardour” each performer plays a sequence of notes of a different duration, so the original composition eventually breaks down into chaos.